With Readly you can read Old King Coal and thousands of other magazines on your tablet and smartphone. Get access to all with just one subscription. New releases and back issues – all included. OLD KING COAL - The birth, life and death of the British deep-mining industry THE year 2016 is the first for centuries in which no deep-mined coal has been produced in the United Kingdom. The last of the country’s collieries was closed at the end of 2015, bringing the curtain down on a vast industry that at one time had boasted 3,000 mines and employed well over a million workers. 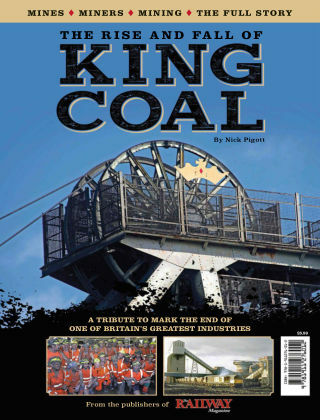 This souvenir edition tells the fascinating story of coal... from its origins in prehistoric swamps to its early primitive mining methods and on to its role as the mineral that fuelled the Industrial Revolution and put the ‘Great’ into Britain. Aimed at the general public as well as miners and mining engineers, it explores the history, operation and layout of the collieries, explains the locations of the coalfields and examines the hazards, hardships, disputes and tragedies that were part of every miner’s life. It also devotes coverage to the railways that were a major and inseparable part of all colliery operations, serving the pits faithfully both on the surface and underground. Finally, with Britain now possessing only a handful of opencast and tiny drift mines while still importing millions of tons of coal from overseas, the UK’s energy policy is examined at a time when many Britons are worrying whether the self-inflicted destruction of the deep-mining industry will one day prove to have been disastrously short-sighted.